Two members of Turkey's main pro-Kurdish party have been arrested for calling Kurdish rebel leader Abdullah Ocalan "Mr Ocalan". The remark came on Saturday in a press statement about prison conditions by two local officials of the Democratic People's Party. They referred to Abdulllah Ocalan as "sayin", which also means "respected and esteemed" in Turkish. They are now accused of "propaganda in favour of a terrorist organisation." Nedim Bicer, head of the party's branch in the south-eastern town of Bismil, and his aide Sadiye Surer will be charged under Turkey's recently revamped anti-terror laws. Turkey's Human Rights Association has condemned the arrest, saying that it violated both the Turkish constitution and the European Human Rights Convention. 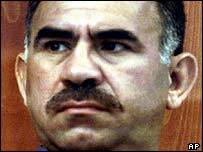 Mr Ocalan is the head of the outlawed Kurdistan Worker's Party, PKK, which has fought a 15-year war for Kurdish autonomy in south-eastern Turkey. The conflict claimed more than 30,000 lives. He was captured in 1999 and is serving a life sentence on a prison island in north-western Turkey.